So Reliance decided to launch 4G at low prices and thus came Reliance Jio. It is not yet officially launched yet but the company plans to reach out to the masses. After the delay in the process finally, Jio Sim will be available to everyone from 15th August. 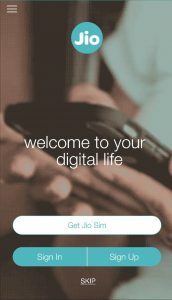 On Independence day, Reliance has decided to release the Jio sims nationwide and attractive plans will be launched so that customer need not break their banks. Reliance Jio came out with many schemes and first Jio sims were on invite basis and reliance jio employees had invites so that they can share those invites with their friends and families. The second scheme came out with LYF smartphones, so the offer is that you have to buy lyf smartphone for the Jio Preview offer valid for 3 months which includes unlimited 4G high-speed data, Unlimited calling and Unlimited Messages. Now, reliance and Samsung collaborated and Samsung users who having Samsung Galaxy S7/S7 edge/ S6 Edge/ S6/ Note 5/ Note edge/ Note 4/ A8/ A7 2016/ A7/ A5 2016/ A5/ now can buy jio sim and get 3 months of unlimited usage. First Download My Jio App from Play Store. Open the app you will get the option to Get Jio Sim. Click on that button you will get a code. Take a print out of the code and documents like Address Proof. Go to any Reliance Digital Store and they will give Sim to you. Trick to Use Reliance Jio Sim in any Phone!!!!!! You need to download MY JIO App from play store and open the app. 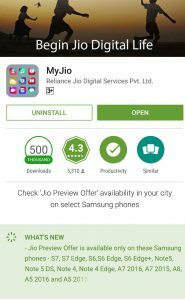 So you also need to download all the apps which are in MY JIo App. Once all the apps are downloaded, turn off your wifi and 4G/3G/2G. Click on my Jio App and you will get the option for “Get Jio Sim”. Click on that button, you will get an error that you are not connected to the internet. Don’t worry. Now turn on the wifi by scrolling down from Quick toggles don’t exit the app and you will get this screen. Terms and conditions. Accept all terms and condition and you will get a code take a printout of that and take your documents to get the sim from reliance digital store. That’s it. So Simple. We tried on a couple of devices like Nexus 6P, Oneplus One and Mi4. Working fine!!!! 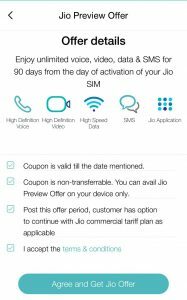 Enjoy 3 Months Unlimited Jio offer!!!!!!! In our testing, we got good speeds in South Delhi about 40-50 MBPS Outdoor and 15-20 MBPS Indoors. Speed is fluctuating a lot. Please share your experience with us. If you have any queries please do write to us. Don’t forget to Subscribe to our youtube channel as we make good content and more coming in the future.